John Crestani’s Internet Jetset – Biggest Scam or Super Affiliate System? The Internet Jetset Super Affiliate System is John Crestani’s online marketing program. It introduces beginners to the world of affiliate marketing, and (surprisingly) gets them started by building a strong foundation. I say surprisingly because training with strong foundation is not very common. More experienced affiliate marketers will also find some great information here. Not only does John offer some unique strategies and “tricks of the trade,” but he brings in other industry experts to teach as well. There are a couple of added bonuses which are worth the $47 alone in my opinion. These are modules that come from The Rich Jerk Series and talk about “Building an Authority Review Site” and "Launch Jacking". If you’ve been at this for awhile, then you know how valuable a single piece of useful advice can be. Online marketing is competitive, and although your audience is massive, it can take significant effort to get the ball rolling (depending on your niche). For those who are serious about making money online, every advantage is critical, and that’s what Internet Jetset provides. It’s not the silver bullet you’re looking for, but if you dig through it deep enough, it has the potential to give you an edge your competitors may not have. The program is broken down into modules. Each module contains videos, resources, links and exercises John want’s you to complete. John Crestani is all about action, and I like that. Internet Jetset is more than just a bunch of instructional videos (although there are plenty of those too). The following is a brief description of each module. The Online Business Blue Print. Here you will get an introduction to affiliate marketing. If you’re new to the make-money-online world, this will expose you to concepts that may surprise you. 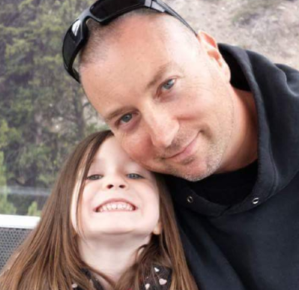 He gets into topics such as recurring commissions and automating your business. However, if you’ve been at this a while, there isn’t anything new in this particular part of the course. I was genuinely surprised by this module. It provides a short welcome video and then gets into the psychology of becoming an entrepreneur and building your online business. There are videos such as ‘Shiny Object Syndrome’, ‘Why People Fail’, and ‘Overcoming Limiting Beliefs’. Also included is a unique gimmick that could get a beginner their first commission within a few hours of joining. If you've never made money online before, this is a mental game changer. It also encourages immediate action so that members don’t become complacent bystanders. This small trick isn’t guaranteed to work. I tried it to give readers an honest review. Having to go outside of my usual marketing channels so my results were not skewed, I did get a few dozen clicks. However, there were no sales. But, if you’re just starting out and have an active social media profile, this little trick might get you your first online dollar. You won’t build a business with it, but it’s a great way for new people to experience (not just read about) how the process works. Again, this module offers some great insight. However, I think there was some critical information left out. 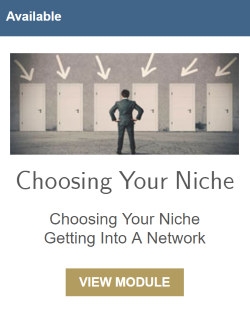 Selecting a niche can be a complicated process, and there are many things to consider which were not dealt with here. The industry and products you decide to promote will depend on which method of affiliate marketing you choose. If you plan on getting free traffic from Google, you’ll need the training to learn competition research. Gaining momentum with free traffic takes more time (than paid traffic) and it only gets tougher in highly competitive niches. For example, you can’t start a website about weight loss and expect to show up in Google search results right away. However, weight loss AFTER AN INJURY may be a winner. Finding those profitable sub-niches requires research and Internet Jetset isn't going to teach you to do that properly. And, this is important to learn because without knowing, you may spend weeks or months in an area that does not turn out to be profitable. But, with money to burn on advertising, you can get your message out there through brute force. In that case, the information in this module is spot on. 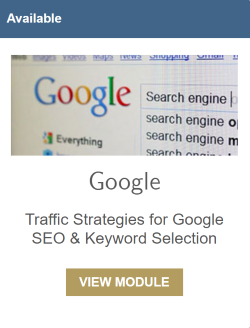 As you might expect, this part of the course is about generating free traffic from search engines, which involve's SEO (Search Engine Optimization) and proper keyword selection. Unfortunately, you WILL NOT find basic SEO training here. SEO is a broad topic (which may be why it’s not covered here) and simply surfing the web to learn it will not cut it for most new people. Having said that, John offers some brilliant advice in this module. An intermediate marketer may find some good stuff here, including a neat keyword trick I hadn’t thought of (or heard of) before. If you’re just starting out though, this module isn’t going to help much, except give you a brief introduction. YouTube isn’t for everyone. Some people are great on camera, and that’s where they shine, while others avoid the camera until their dying breath. Either way, there is some great training here. Many programs just tell you to throw a video up on YouTube and review a product, and that’s the extent of their training. Not so for Internet Jetset. There are 12 videos in this section. Some short ones, and some not so short. I haven’t had a chance to go through them all yet. But, since I’ve only just started with YouTube myself, I will be studying this section carefully. The videos I did watch provided critical information I haven’t found before (that doesn’t mean it’s not out there). 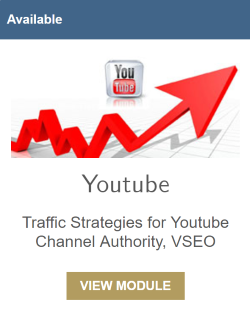 With my limited YouTube experience, I can’t say this is the best training out there, but it is detailed. Facebook has changed over the last couple years, and is now all about paid ads, so I thought this module would discuss targeting, landing pages etc. I was surprised however by a 50-minute video talking about FREE Facebook traffic. There are some great tips here, mainly walk-through's on how to optimize your Facebook Pages as well as some important social media habits. However, if you’re looking for specific information about HOW TO build your following, you won’t get that here. And it’s not that important anyway because, in a June 2016 statement, Facebook announced that brand and fan page content would no longer be a priority in people’s newsfeeds. In other words, even if you build up a following with tens of thousands of people, most will never see your post’s anyway. Those that built their business and brands using ONLY Facebook had two choices. Let it crumble, or start paying for Advertising. To his credit, John Crestani (unlike many online "guru's") tells you that smart marketers bring their audience to a website or blog that THEY own, and don’t rely on social media platforms. And that's the perfect lead-in to his next module. John takes a backseat in this one. It is taught by Ashley B. Coombe, the author of 30 Tips, Tricks and Tools To Save You Time: With Social Media and Blogging. There are 15 videos, and Ashley takes you step-by-step through setting up your own WordPress Website, theme and plugins. Many programs today barely touch on this topic (except for some basic stuff to set up a landing page and an email auto-responder). And some neglect it entirely and focus only on social media platforms. As mentioned above though, having your own home on the internet is critical and here, Ashley has you covered. I was most excited for this part of the course. As it turns out, there isn’t much here. But, what you do get is fantastic, and a potential game changer for every online marketer. Depending you your promotion strategies, these insights could be the difference between failure, or freedom. The next two modules are bonuses that come from the Rich Jerk Course. Although these courses are dated (mid-2015 it looks like), you’ll uncover some real gems here… strategies and tactics that go beyond most generic stuff that’s out there. John Crestani and the experts he invites to teach this course are a group of super-affiliates who earn absurd amounts of money online. When you go through this material (depending on your experience level) you begin to understand why. John Crestani talks a lot about generating FREE traffic which sets Internet Jetset apart from a lot of programs that teach only paid advertising. There is some unique content here that isn’t found in other programs you typically find in this price range. John seems genuine and wants to deliver a good experience to those who join his program. The addition of the Rich Jerk Modules 'Launch Jacking' and 'Authority Review Sites'. The course is relatively short (although Internet Jetset has the potential to become an industry leader). I wish the community were larger and more active. There isn’t much happening on the Facebook group or the forums. Internet Jetset has solid information for beginners and the more experienced but seems a little empty in the middle. Although there are some useful tips for free traffic, general SEO (search engine optimization) is not covered. There are upsells, affiliate links and invites everywhere trying to bring you further into the sales funnel. For $47, I recommend John's program. There is also an immediate $187 upsell that I did not purchase. I would not recommend it as your ONLY course, but if you’re like me and belong to a few different programs, then Internet Jetset is a must have tool in your bag of tricks. That doesn’t take anything away from Internet Jetset though. As mentioned earlier, as it matures (and courses get added) I think John Crestani’s program has the potential to become home to many affiliate marketers. 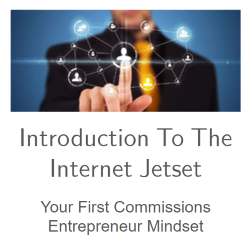 For more information and free webinar, check out the Internet Jetset Super Affiliate System Here. I hope my review has been helpful and if you have any comments or question, please leave them below; I’d love to hear your thoughts. 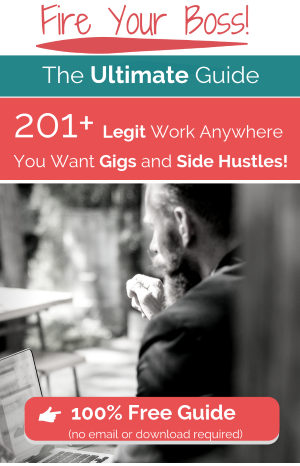 Do you have experience with Internet Jetset or one of John Crestani's previous programs? i attended the internet jetset and super affiliate program. it is not a scam to my point of view, John is knowledgeable and teaches face to face with us. who can find a coach face to face with whole a lot of experience and would like to give you feedback if you provide your campaign or even idea? the con is the course needs updated, some of the video are old and poor quality. but the content and the weekly webinar worth investment to me. this is just my personal review of the course for reference. From what I have found from The Internet Jetset program is that it does add some value but mainly if you uare just starting out and as far as the link jacking section which is an added bonus, it is a complete joke and I would just ignore that part. Hey Shane, thanks for stopping by and sharing your insight. I do agree with you. As far as link jacking (I’m assuming you’re referring to the launch jacking section), as I mentioned in my review, it is dated. It’s not a strategy that’s entirely out of date (because there are some people still making money with it), but the tactics they recommend definitely are, and as you mention much of it Google would just see as spam today. Launch jacking today is extremely saturated with people who are either reviewing a product that hasn’t even come out yet (in other words, they’re just repeating the sales copy), or from insiders who get early access to the product. The problem with being an ‘insider’, is that the privilege is only given to those who hype the product. If you become known for giving unbiased reviews (saying anything that could hurt sales), product creators will stop giving you early access to their products. So to remain in the circle, you have to sacrifice honesty… or at the very least walk a fine line. You could, in theory, just not write a review for those products that are no good… but you’ll be spending countless hours to test several products just to find one that’s good. But for launch jacking to work, you need to test and review products quickly (to beat your competitors to it) and frequently (up to several a week) because not all of them will rank well in Google or on Bing. You might do 10 reviews and only 3 make it to the front page of the search engine results (if any at all). So if you’re testing 10 products just to find one good one, and writing 10 reviews just to rank one or two… you can’t compete with those who just hype every product that comes their way, even if it’s junk or even a scam. It is a good module to go through however if you have the time because it gives you further insight into the tactics and strategies online marketers have used. Sometimes knowing what not to do is just as important as knowing what you should do. It can save you a lot of time down the road so you don’t fall victim to snake oil salesmen peddling yesterday’s junk (and there are many out there). And… if you’re an advanced online marketer, sometimes you can find forgotten tactics that might still work if used in a different way. As far as the rest of the program, I agree. There is definitely value here. As I mentioned, it’s not as complete as some other programs… and if you want to learn legitimate (bread and butter) SEO I recommend Wealthy Affiliate for that because it sets you on the right path for a long-term business in a niche YOU choose… but I also wouldn’t overlook Internet Jetset. Again, I appreciate your insights and agree. Not my experience, this site most be one of Johns students, the info is over priced, and the pyramidal scheme with his other businesses is not nice, you feel you are trained to be one of his bots in the upper chains, second all the time they are brainwashing you with their emotional motivational stuff, third a very uncool no return policy, he says he will give you the money back if you dont like it, guess what he wont, even in his website they say we dont give money back just in extreme cases, whats that? third I did ask for a refund from click bank and im yet to get something back, they even charged me for a second month I didnt attended since i cancel the original purchase so I have a lot of doubts about this, and if my review wont show in this website means this website is another trick, just another guy brainwashed into promoting his course for the affiliate commision, but many people have tried scamming like this many ended up in jail, just ask the real wolf of wallstreet!! Thanks for your comment, and I appreciate your insight. I’m definitely not one of John’s “students” lol. I’ve gone through the material and I’ve taken some of it to apply to my own business, but that’s all. We’ve definitely had different experiences though. The information inside the Internet Jetset course is really good, and unless we’re talking about something different, it’s only $47 (which isn’t unreasonable for what you’re getting). I did mention in my review though that I wouldn’t recommend it as your only source of information for building an online business. Also, since writing this review, John has added another bonus (7.5 hours of Facebook Ads training by Carlos Cruz). I was going to update my review to mention this, but there was also a YouTube training bonus that’s now been removed… so to be honest, I’m not sure if the Facebook Ads bonus will always be there. As far as the return policy goes, I have never asked for a refund so I can’t give an honest assessment of that process. I did, however, cancel my “recurring” membership months ago without any problems at all. I went back in my emails to see if I had contacted John directly about it but it looks like I just went through Clickbank. I’d be interested to hear how it turns out now that you’ve gone directly to them. I’ve never had any issues with Clickbank. One of the reasons I recommend Wealthy Affiliate is because you don’t need a credit card to check it out, and therefore you never have to worry about refunds and getting your money back. About a pyramid scheme… again, I really can’t comment. Since canceling my recurring membership I don’t attend any regular webinars or training. Internet Jetset has an affiliate program and maybe that’s what you’re referring to, but that’s not a pyramid scheme. If you were to promote Internet Jetset, you would get a commission from that sale but that is all. You would not get any payment or benefit if that person went on to recommend the program. In other words, they’re not “under” you. They would be just another member like you. I’ve been a personal development junkie for more than 20 years so I don’t mind the “emotional motivational stuff” lol. Building an online business (or any business) is not easy. Most people give up (often right before they would have found some success), so mind-set is a huge component of any program. I definitely appreciate your perspective though, and thanks for stopping by to read my review.